For having continous integration in your multimedia project hosted in GitHub with TravisCI, you may want to compile and run tests with a recent version of GStreamer. Nonetheless, TravisCI mainly offers Ubuntu Trusty as one of the possible distributions to deploy in their CI, and that distribution packages GStreamer 1.2, which might be a bit old for your project’s requirements. A solution for this problem is to provide to TravisCI your own GStreamer bundle with the version you want to compile and test on you project, in this case 1.14. The present blog is recipe I followed to generate that GStreamer bundle with GstGL support. The packaged libglib version is too old, hoping that we will not find an ABI breakage while running the CI. As we want to compile GStreamer using gst-build, we need a recent version of meson, which requires python3.5, not available in Trusty. Old habits die hard, and I have used schroot for handle chroot environments without complains, it handles the bind mounting of /proc, /sys and all that repetitive stuff that seals the isolation of the chrooted environment. The debootstrap’s variant I use is buildd because it installs the build-essential package. This is the schroot configuration I will use. Please, adapt it to your need. I am overrinding the fstab default file for a custom one where the home directory of vjaquez user aims to a clean directory. # fstab: static file system information for chroots. We will get into the chroot environment as super user in order to add the required packages. For that pupose we add universe repository in apt. Finally we create our installation prefix. In this case /opt/gst to avoid the contamination of /usr/local and logout as root. Now, let’s login again, but as the unprivileged user, to build the bundle, starting with ffmpeg. Notice that we are using ccache and building out-of-source. Pyenv is a project that allows the automation of installing and executing, in the user home directory, multiple versions of Python. We will install the last available version of meson in the user home directory, that is why PATH is extended and exported. PKG_CONFIG_PATH is exported to expose the compiled versions of ffmpeg and glib. Notice that the libraries are installed in /opt/lib in order to avoid the dispersion of pkg-config files. And the list of available elemente shall be shown. This is the first semiyearly report about Igalia’s activities around multimedia, covering the second half of 2018. MSE is a specification that allows JS to generate media streams for playback for Web browsers that support HTML 5 video and audio. Last semester we upstreamed the support to WebM format in WebKitGTK with the related patches in GStreamer, particularly in qtdemux, matroskademux elements. EME is a specification for enabling playback of encrypted content in Web bowsers that support HTML 5 video. In a downstream project for WPE WebKit we managed to have almost full test coverage in the YoutubeTV 2018 test suite. We merged our contributions in upstream, WebKit and GStreamer, most of what is legal to publish, for example, making demuxers aware of encrypted content and make them to send protection events with the initialization data and the encrypted caps, in order to select later the decryption key. We started to coordinate the upstreaming process of a new implementation of CDM (Content Decryption Module) abstraction and there will be even changes in that abstraction. Lighting talk about EME implementation in WPE/WebKitGTK in GStreamer Conference 2018. WebRTC consists of several interrelated APIs and real time protocols to enable Web applications and sites to captures audio, or A/V streams, and exchange them between browsers without requiring an intermediary. We added GStreamer interfaces to LibWebRTC, to use it for the network part, while using GStreamer for the media capture and processing. All that was upstreamed in 2018 H2. Thibault described thoroughly the tasks done for this achievement. Talk about WebRTC implementation in WPE/WebKitGTK in WebEngines hackfest 2018. Servo is a browser engine written in Rust designed for high parallelization and high GPU usage. We added basic support for <video> and <audio> media elements in Servo. Later on, we added the GstreamerGL bindings for Rust in gstreamer-rs to render GL textures from the GStreamer pipeline in Servo. Lighting talk in the GStreamer Conference 2018. Taking an idea from the GStreamer Conference, we developed a GStreamer source element that wraps WPE. With this source element, it is possible to blend a web page and video in a single video stream; that is, the output of a Web browser (to say, a rendered web page) is used as a video source of a GStreamer pipeline: GstWPE. The element is already merged in the gst-plugins-bad repository. At last, but not the least, we continued helping with the maintenance of GStreamer-VAAPI and gst-msdk, with code reviewing and on-going migration of the internal library to GObject. Web Engines Hackfest in Coruña. Finally, we participated as mentors in the last Google Summer of Code. Georg Ottinger, among other completed tasks, sketched an AV1 parser for GStreamer, though it needs a couple more iterations to get it merged. Thanks to bear with us along all this blog post and to keeping under your radar our work. Rust is a great programming language but the community around it’s just amazing. Those are the ingredients for the craft of useful software tools, just like Servo, an experimental browser engine designed for tasks isolation and high parallelization. Both projects, Rust and Servo, are funded by Mozilla. Thanks to Mozilla and Igalia I have the opportunity to work on Servo, adding it HTML5 multimedia features. First, with the help of Fernando Jiménez, we finished what my colleague Philippe Normand and Sebastian Dröge (one of my programming heroes) started: a media player in Rust designed to be integrated in Servo. This media player lives in its own crate: servo/media along with the WebAudio engine. A crate, in Rust jargon, is like a library. This crate is (very ad-hocly) designed to be multimedia framework agnostic, but the only backend right now is for GStreamer. Later we integrated it into Servo adding an initial support for audio and video tags. Currently, servo/media passes, through a IPC channel, the array with the whole frame to render in Servo. This implies, at least, one copy of the frame in memory, and we would like to avoid it. For painting and compositing the web content, Servo uses WebRender, a crate designed to use the GPU intensively. Thus, if instead of raw frame data we pass OpenGL textures to WebRender the performance could be enhanced notoriously. Luckily, GStreamer already supports the uploading, downloading, painting and composition of video frames as OpenGL textures with the OpenGL plugin and its OpenGL Integration library. Even more, with plugins such as GStreamer-VAAPI, Gst-OMX (OpenMAX), and others, it’s possible to process video without using the main CPU or its mapped memory in different platforms. But from what’s available in GStreamer to what it’s available in Rust there’s a distance. Nonetheless, Sebastian has putting a lot of effort in the Rust bindings for GStreamer, either for applications and plugins, sadly, GStreamer’s OpenGL Integration library (GstGL for short) wasn’t available at that time. So I rolled up my sleeves and got to work on the bindings. These are the stories of that work. As GStreamer shares with GTK+ the GObject framework and its introspection mechanism, both projects have collaborated on the required infrastructure to support Rust bindings. Thanks to all the GNOME folks who are working on the intercommunication between Rust and GObject. The quest has been long and complex, since Rust doesn’t map all the object oriented concepts, and GObject, being a set of practices and software helpers to do object oriented programming with C, its usage is not homogeneous. The Rubicon that ease the generation of Rust bindings for GObject-based projects is GIR, a tool, written in Rust, that reads gir files, along with metadata in toml, and outputs two types of bindings: sys and api. Rust can call external functions through FFI (foreign function interface), which is just a declaration of a C function with Rust types. But these functions are considered unsafe. The sys bindings, are just the exporting of the C function for the library organized by the library’s namespace. The next step is to create a safe and rustified API. This is the api bindings. As we said, GObject libraries are quite homogeneous, and even following the introspection annotations, there will be cases where GIR won’t be able to generate the correct bindings. For that reason GIR is constantly evolving, looking for a common way to solve the corner cases that exist in every GObject project. For example, these are my patches in order to generate the GstGL bindings. For this document we assume that the reader has a functional Rust setup and they know the basic concepts. The reason to build gir in release mode is because, otherwise would be very slow. These kind of bindings are normally straight forward (and unsafe) since they only map the C API to Rust via FFI mechanism. If there something strange, we should fix the code that generated it. If that is not possible, the last resource is to fix the gir file directly, which is just XML, not manually but through a script using xmlstartlet. See fix.sh in gtk-rs as example. Create the toml file with the metadata required to create the bindings. In other words, this file contains the exceptions, rules and options used by the tool to generated the bindings. See Gir_GstGL.toml in gstreamer-rs-sys as example. The documentation of the toml file is in the gir’s README.md file. This command will generate, as specified in the toml file (target_path), a crate in the directory named gstreamer-gl-sys. Again, it would be possible to end up applying fixes to the gir file through a fix.sh script using xmlstartlet. And again, the confection of the toml file might take a lot of time, by trial and error, by cleaning and tidying up the API. See Gir_GstGL.toml in gstreamer-rs as example. A good way to test your bindings is by crafting a test application, which shows how to use the API. Personally I devoted a ton of time in the test application for GstGL, but worth it. It made me aware of a missing part in the crate used for GL applications in Rust, named Glutin, which was a way to get the used EGLDisplay. So also worked on that and sent a pull request that was recently merged. The sweets of the free software development. Nowadays I’m integrating GstGL API in servo/media and later, Servo! I tried, several months ago, the open source version of Intel MediaSDK and it was a complete mess. In order to review some patches for gst-msdk I tried it again. I am surprised how the situation has improved since then. gst-build is far superior than gst-uninstalled scripts for developing GStreamer, mainly because its meson and ninja usage. Nonetheless, to integrate external dependencies it is not as easy as in gst-uninstalled. This guide aims to show how to integrate GStreamer-VAAPI dependencies, in this case with the Intel VA-API driver. For now we will need meson master, since it this patch is required. The pull request is already merged but it is unreleased yet. The patch will add the repositories for libva and intel-vaapi-driver. Running this command, all dependency repositories will be cloned, symbolic links created, and the build directory configured. This patch is required since the headers files uninstalled paths doesn’t match with the ones in the “include” directives. The patch handles libva dependency as a subproject. Note to myself: this patch must be split and merged in upstream. And wait a couple minutes. GStreamer VA-API is not a trivial piece of software. Even though, in my opinion it is a bit over-engineered, the complexity relies on its layered architecture: the user must troubleshoot in which layer is the failure. And the point of failure could be anywhere. libva is a library designed to load another library called driver or back-end. This driver is responsible to talk with the kernel, windowing platform, memory handling library, or any other piece of software or hardware that actually will do the video processing. There are many drivers in the wild. As it is an API aiming to stateless video processing, and the industry is moving towards that way to process video, it is expected more drivers would appear in the future. Remember, if you set it, you are on your own, since we do not trust on the maturity of that driver yet. Thus, there is an internal API between libva and the driver and it is versioned, meaning that the internal API version of the installed libva library must match with the internal API exposed by the driver. One of the causes that libva could not initialize a driver could be because the internal API version does not match. 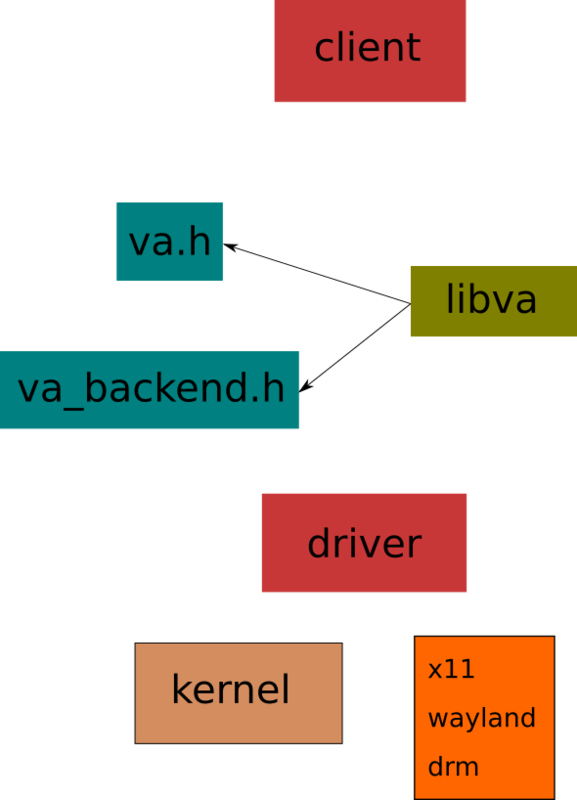 The driver path, as a directory, might contain several drivers. libva will try to guess the correct one by querying the instantiated VA display (which could be either KMS/DRM, Wayland, Android or X11). If the user instantiates a VA display different of his running environment, the guess will be erroneous, the library loading will fail. With this setting, libva will try to load iHD_drv_video.so (a new and experimental open source driver from Intel™, targeted for MediaSDK —do not use it yet with GStreamer VAAPI—). vainfo is the diagnostic tool for VA-API. In a couple words, it will iterate on a list of VA displays, in try-and-error strategy, and try to initialize VA. In case of success, vainfo will report the driver signature, and it will query the driver for the available profiles and entry-points. error: can't connect to X server! Does this mean that VA-API processes video? No. It means that there is an usable VA display which could open a driver correctly and libva can extract symbols from it. I would like to mention another tool, not official, but I like it a lot, since it extracts almost of the VA information available in the driver: vadumpcaps.c, written by Mark Thompson. When GStreamer is launched, normally it will register all the available plugins and plugin features (elements, device providers, etc.). All that data is cache and keep until the cache file is deleted or the cache invalidated by some event. At registration time, GStreamer VA-API will instantiate a DRM-based VA display, which works with no need of a real display (in other words, headless), and will query the driver for the profiles and entry-points tuples, in order to register only the available elements (encoders, decoders. sink, post-processor). If the DRM VA display fails, a list of VA displays will be tried. Beside the normal behavior, GStreamer VA-API will also invalidate GStreamer’s cache at every boot, or when any of the mentioned environment variables change. And, if you decide to file a bug in bugzilla, please do not forget to attach the output of vainfo and the logs if the developer asks for them. GStreamer VA-API 1.14: what’s new? As you may already know, there is a new release of GStreamer, 1.14. In this blog post we will talk about the new features and improvements of GStreamer VA-API module, though you have a more comprehensive list of changes in the release notes. Most of the topics explained along this blog post are already mentioned in the release notes, but a bit more detailed. We have improved DMA-buf’s usage, mostly at downstream. In the case of upstream, we just got rid a nasty hack which detected when to instantiate and use a buffer pool in sink pad with a dma-buf based allocator. This functionality has been already broken for a while, and that code was the wrong way to enabled it. The sharing of a dma-buf based buffer pool to upstream is going to be re-enabled after bug 792034 is merged. For downstream, we have added the handling of memory:DMABuf caps feature. The purpose of this caps feature is to negotiate a media when the buffers are not map-able onto user space, because of digital rights or platform restrictions. For example, currently intel-vaapi-driver doesn’t allow the mapping of its produced dma-buf descriptors. But, as we cannot know if a back-end produces or not map-able dma-buf descriptors, gstreamer-vaapi, when the allocator is instantiated, creates a dummy buffer and tries to map it, if it fails, memory:DMABuf caps feature is negotiated, otherwise, normal video caps are used. First of all, GStreamer VA-API has support now for libva-2.0, this means VA-API 1.10. We had to guard some deprecated symbols and the new ones. Nowadays most of distributions have upgraded to libva-2.0. We have improved the initialization of the VA display internal structure (GstVaapiDisplay). Previously, if a X based display was instantiated, immediately it tried to grab the screen resolution. Obviously, this broke the usage of headless systems. We just delay the screen resolution check to when the VA display truly requires that information. New API were added into VA, particularly for log handling. Now it is possible to redirect the log messages into a callback. Thus, we use it to redirect VA-API message into the GStreamer log mechanisms, uncluttering the console’s output. Also, we have blacklisted, in autoconf and meson, libva version 0.99.0, because that version is used internally by the closed-source version of Intel MediaSDK, which is incompatible with official libva. By the way, there is a new open-source version of MediaSDK, but we will talk about it in a future blog post. Normally, the object GstVaapiDisplay is shared among the pipeline through the GstContext mechanism. But this class is defined internally and it is not exposed to users since release 1.6. This posed a problem when an application wanted to create its own VA Display and share it with an embedded pipeline. The solution is a new context application message: gst.vaapi.app.Display, defined as a GstStructure with two fields: va-display with the application’s vaDisplay, and x11-display with the application’s X11 native display. In the future, a Wayland’s native handler will be processed too. Please note that this context message is only processed by vaapisink. One precondition for this solution was the removal of the VA display cache mechanism, a lingered request from users, which, of course, we did. A hardware accelerated driver, as the Intel one, may have custom offsets and strides for specific memory regions. We use the GstVideoMeta to set this custom values. The problem comes when downstream does not handle this meta, for example, appsink. Then, the user expect the “normal” values for those variable, but in the case of GStreamer VA-API with a hardware based driver, when the user displays the frame, it is shown corrupted. In order to fix this, we have to make a memory copy, from our custom VA-API images to an allocated system memory. Of course there is a big CPU penalty, but it is better than delivering wrong video frames. If the user wants a better performance, then they should seek for a different approach. I know, GstGLUploadTextureMeta must die, right? I am convinced of it. But, Clutter video sink uses it, an it has a vast number of users, so we still have to support it. Last release we had remove the support for EGL/Wayland in the last minute because we found a terrible bug just before the release. GLX support has always been there. With Daniel van Vugt efforts, we resurrected the support for that meta in EGL. Though I expect the replacement of Clutter sink with glimagesink someday, soon. vaapisink was demoted to marginal rank on Wayland because COGL cannot display YUV surfaces. This means, by default, vaapisink won’t be auto-plugged when playing in Wayland. The reason is because Mutter (aka GNOME) cannot display the frames processed by vaapisink in Wayland. Nonetheless, please note that in Weston, it works just fine. We have improved a little bit upstream renegotiation: if the new stream is compatible with the previous one, there is no need to reset the internal parser, with the exception of changes in codec-data. A new property has added only to H.264 decoder: low-latency. Its purpose is for live streams that do not conform the H.264 specification (sadly there are many in the wild) and they need to twitch the spec implementation. This property force to push the frames in the decoded picture buffer as soon as possible. This is the result of the Google Summer of Code 2017, by Orestis Floros. When this property is enabled, all the MVC (Multiview Video Coding) or SVC (Scalable Video Coding) frames are dropped. This is useful if you want to reduce the processing time or if your VA-API driver does not support those kind of streams. In this release we have put a lot of effort in encoders. It is possible, for certain back-ends and profiles (for example, H.264 and H.265 encoders with Intel driver), to specify a set of regions of interest per frame, with a delta-qp per region. This mean that we would ask more quality in those regions. In order to process regions of interest, upstream must add to the video frame, a list of GstVideoRegionOfInterestMeta. This list then is traversed by the encoder and it requests them if the VA-API profile, in the driver, supports it. The common use-case for this feature is if you want to higher definition in regions with faces or text messages in the picture, for example. quality-level: For all the available encoders. This is number between 1 to 8, where a lower number means higher quality (and slower processing). aud: This is for H.264 encoder only and it is available for certain drivers and platforms. When it is enabled, an AU delimiter is inserted for each encoded frame. This is useful for network streaming, and more particularly for Apple clients. mbbrc: For H.264 only. Controls (auto/on/off) the macro-block bit-rate. temporal-levels: For H.264 only. It specifies the number of temporal levels to include a the hierarchical frame prediction. prediction-type: For H.264 only. It selects the reference picture selection mode. The frames are encoded as different layers. A frame in a particular layer will use pictures in lower or same layer as references. This means decoder can drop frames in upper layer but still decode lower layer frames. hierarchical-p: P frames, except in top layer, are reference frames. Base layer frames are I or B.
hierarchical-b: B frames , except in top most layer, are reference frames. All the base layer frames are I or P.
refs: Added for H.265 (it was already supported for H.264). It specifies the number of reference pictures. qp-ip and qp-ib: For H.264 and H.265 encoders. They handle the QP (quality parameters) difference between the I and P frames, the the I and B frames respectively. H.264 and H.265 encoders now can configure the desired media profile through the downstream caps. Many thanks to all the contributors and bug reporters. Author vjaquezPosted on March 27, 2018 Categories Planet IgaliaTags gstreamer, vaapiLeave a comment on GStreamer VA-API 1.14: what’s new? Recently, our friend Florent complained that it was impossible to set a constant bitrate when encoding H.264 using low-power profile with gstreamer-vaapi . Low-power (LP) profiles are VA-API entry points, available in Intel SkyLake-based procesor and succesors, which provide video encoding with low power consumption. Later on, Ullysses and Sree, pointed out that CBR in LP is ony possible if HuC is enabled in the kernel. HuC is a firmware, loaded by i915 kernel module, designed to offload some of the media functions from the CPU to GPU. One of these functions is bitrate control when encoding. HuC saves unnecessary CPU-GPU synchronization. In order to load HuC, it is required first to load GuC, another Intel’s firmware designed to perform graphics workload scheduling on the various graphics parallel engines. How we can install and configure these firmwares to enable CBR in low-power profile, among other things, in Debian/testing? $ sudo modinfo i915 | egrep -i "guc|huc|dmc"
UPDATE: In order to install this Debian package, you should have enabled the non-free apt repository in your sources list. $ journalctl -b -o short-monotonic -k | egrep -i "i915|dmr|dmc|guc|huc"
That means that HuC and GuC firmwares were loaded successfully. Got EOS from element "pipeline0". Everybody knows it: install Intel MediaSDK in GNU/Linux is a PITA. With CentOS or Yocto is less cumbersome, if you trust blindly on scripts ran as root. I don’t like CentOS, I feel it like if I were living in the past. I like Debian (testing, of course) and I also wanted to understand a little more about MediaSDK. And this is what I did to have Intel MediaSDK working in Debian/testing. First, I did a pristine installation of Debian testing with a netinst image in my NUC 6i5SYK, with a normal desktop user setup (Gnome3). Intel’s identifies two types of MediaSDK installation: Gold and Generic. Gold is for CentOS, and Generic for the rest of distributions. Obviously, Generic means you’re on your own. For the purpose of this exercise I used as reference Generic Linux* Intel® Media Server Studio Installation. Let’s begin by grabbing the Intel® Media Server Studio – Community Edition. You will need to register yourself and accept the user agreement, because this is proprietary software. Bad news: in order to get MediaSDK working you need to patch the mainlined kernel. Worse news: the available patches are only for the version 4.4 the kernel. Still, systemd works on 4.4, as far as I know, so it would not be a big problem. I like to use the sources from the git repository, since it would be possible to do some rebasing and blaming in the future. The patches should apply with some warnings but no fatal errors (don’t worry, be happy). TODO: Shall I need to modify the EXTRAVERSION string in kernel’s Makefile? Notice that we are using our current kernel configuration. That is error prone. I guess that is why I had to select NVM manually. This part was absolutely tricky for me. It took me a long time to figure out how to specify the kernel ID in the grubenv. And change the line GRUB_DEFAULT=saved. By default it is set to 0. And update GRUB. Please note it is twice and separated by a >. Don’t ask me why. I like to use rsync rather normal cp because there are the options like --dry-run and --itemize-changes to verify what I am doing. All these directories contain blobs that do the MediaSDK magic. They are dlopened by hard coded paths by mfx_dispatch, which will be explain later. In /lib lives the firmware (kernel blob). In /opt/intel/common… I have no idea what are those shared objects. In /opt/intel/mediasdk/include live header files for programming an compilation. In /opt/intel/mediasdk/lib64 live the driver for the modified libva (iHD) and other libraries. In conclusion, all these bytes are darkness and mystery. The system should boot, automatically, in GNU/Linux 4.4. Please, log with Xorg, not in Wayland, since it is not supported, as far as I know. For compiling GStreamer I will use gst-uninstalled. Someone may say that I should use gst-build because is newer and faster, but I feel more comfortable doing the following kind of hacks with the old&good autotools. Basically this is a reproduction of Quick-start guide to gst-uninstalled for GStreamer 1.x. I will modify the gst-uninstalled script, and keep it outside of the repository. For that I will use the systemd file-hierarchy spec for user’s executables. Do not forget to edit your ~/.profile to add ~/.local/bin in the environment variable PATH. The modifications are to handle the three dependencies libraries that are required by MediaSDK: libdrm, libva and mfx_dispatch. Grab libdrm from its repository and switch to the branch with the supported version by MediaSDK. Extract the distributed tarball in the cloned repository. Then we could check the big delta between upstream and the changes done by Intel for MediaSDK. Let’s put it in a commit for later rebases. $ git commit -m "mediasdk changes"
Get build dependencies and compile. Since the pkgconfig files (*.pc) of libdrm are generated to work installed, it is needed to modify them in order to work uninstalled. In order to C preprocessor could find the uninstalled libdrm header files we need to make them available in the expected path according to the pkgconfig file and right now they are not there. To fix that it is possible to create proper symbolic links. This modified a version of libva. These modifications messed a bit with the opensource version of libva, because Intel decided not to prefix the library, or some other strategy. In gstreamer-vaapi we had to blacklist VA-API version 0.99, because it is the version number, arbitrary set, of this modified version of libva for MediaSDK. Again, grab the original libva from repo and change the branch aiming to the divert point. It was difficult to find the divert commit id since even the libva version number was changed. Doing some archeology I guessed the branch point was in version 1.0.15, but I’m not sure. $ git commit -m "mediasdk"
Before compile, verify that Makefile is going to link against the uninstalled libdrm. You can do that by grepping for LIBDRM in Makefile. Get compilation dependencies and build. This static library which must be linked with MediaSDK applications. In our case, to the GStreamer plugin. the dispatcher is a layer that lies between application and the SDK implementations. Upon initialization, the dispatcher locates the appropiate platform-specific SDK implementation. If there is none, it will select the software SDK implementation. The dispatcher will redirect subsequent function calls to the same functions in the selected SDK implementation. And compile. After running ./configure it is better to confirm, grepping the generated Makefie, that the uninstalled versions of libdrm and libva are going to be used. At last we are in a position where it is possible to test if everything works as expected. For it we are going to run the pre-compiled version of vainfo bundled in the tarball. We will copy it to our uninstalled setup, thus we would running without specifing the path. I normally make a copy of ~/gst/master/gstreamer/script/git-update.sh in ~/.local/bin in order to modify it, like adding support for ccache, disabling gtkdoc and gobject-instrospections, increase the parallel tasks, etc. But that is out of the scope of this document. 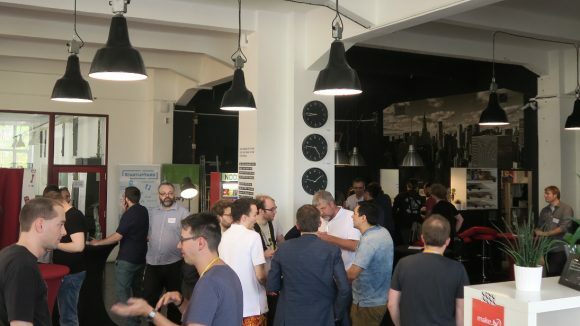 This year, the GStreamer Conference happened in Prague, along with the traditional autumn Hackfest. Prague is a beautiful city, though this year I couldn’t visit it as much as I wanted, since the Embedded Linux Conference Europe and the Open Source Summit also took place there, and Igalia, being a Linux Foundation sponsor, had a booth in the venue, where I talked about our work with WebKit, Snabb, and obviously, GStreamer. But, let’s back to the GStreamer Hackfest and Conference. One of the features that I like the most of the GStreamer project is its community, the people involved in it, by writing code, sharing their work with many others. They might appear a bit tough at beginning (or at least that looked to me) but in real they are all kind and talented persons. And I’m proud of consider myself part of this community. Nonetheless it has a diversity problem, as many other Open Source communities. During the Hackfest, Hyunjun and I, met with Sree and talked about the plans for GStreamer-VAAPI, the new features in VA-API and libva and how we could map them to the GStreamer’s design. Also we talked about the future developments in the msdk elements, merged one year ago in gst-plugins-bad. Also, I talked a bit with Nicolas Dufresne regarding kmssink and DMABuf. In the Conference, which happened in the same venue as the hackfest, I talked wit the authors of gstreamer-media-SDK. They are really energetic. My colleague Enrique talked in the Conference about the Media Source Extensions (MSE) on WebKit, and Hyunjun shared his experience with VA-API on Rust. Also, in the conference venue, we showed a couple demos. One of them was a MinnowBoard running WPE, rendering videos from YouTube using gstreamer-vaapi to decode video.